Recently, on a beautiful Sunday afternoon here in Northern California, my teenaged son and I decided to head out to the Crocker Art Museum in Sacramento. Since its major renovation and expansion a few years ago, the museum continues to grow in its regional presence and quality. We’ve always enjoyed a trip to the Crocker. Now, we get to see many new additions to the museum’s permanent collection as well as some spectacular special exhibits. I am not an artist. I do hold art in a place of importance to my creative life. Art is a poem or a song captured in its deepest or most profound moment. The reflection of lives lived and living may mirror our own desires, joys, difficulties, triumphs or the silly or ironic nature of our time on this planet. I am an amateur enthusiast of all schools and media. I am not interested in whether the artist defines the art or the art defines the artist. I only know when a piece “speaks” to me. The following are pieces that inspired me from our recent visit. Joan Brown, Wolf in Studio, 1972. Enamel on Masonite. 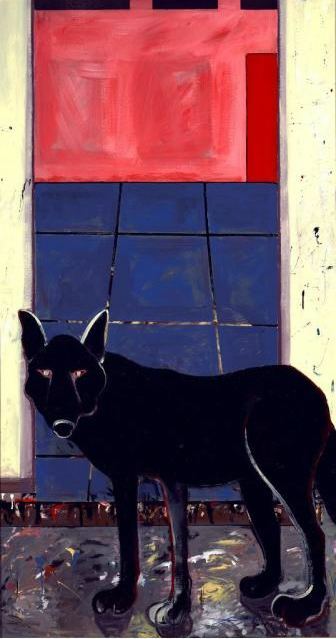 Artist Joan Brown looked to animals to express different elements in her art. The lone wolf is a powerful symbol of independence and solitude. Here the wolf stands before a painting in process. He or she stares deeply at the observer, the artist. Wolf in Studio caused me to stop short and stare. The creative life requires a certain amount of independence and often overwhelming solitude. For me, on this day, the wolf was the creativity that has eluded me in these recent months. The drive to be creative does not always equal talent. I am coming to terms with my lone wolf as she stands before me with her driven eyes that challenge, inspire and frustrate depending on the day and my mood. Irving Norman’s view of 20th century war and human struggle captured me. 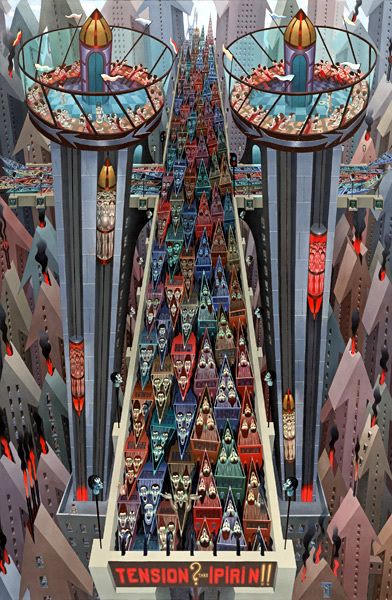 Apparently, he was influenced by muralists like Diego Riviera. A child of the first half of the 20th century, Norman explored the horrifying inhumanity of war and its destructive technology. Irving Norman, My World and Yours (And the Gods Created the World in Their Own Image), 1954. Oil on canvas. Irving Norman, Cross…Road, 1973. Oil on canvas. For me, these two paintings by Norman still ring startlingly and frighteningly true. Man’s inhumanity to man is not a distant and ancient concept. Inhumanity is here and now in great ways — war, destructive, mass poverty — and in the small ways — isolation in an ever-connected world, childhood bullying, loss of quiet. Judith Lowry is an artist closer to home for those who live in the region. Her California Native ancestry comes through in her art that takes its inspiration from stories told by her father. I simply love the vibrant colors and the Native stories told. Welgatim’s Song tells the story of coyote’s wife. Judith Lowry, Welgatim’s Song, 2001. Acrylic on canvas. 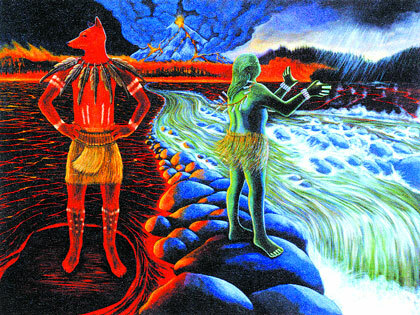 Welgatim is the Old Frog Woman, married to Weh-Pom (Coyote). She lovingly cooked for him every day while singing about her happiness. Yet Weh-Pom desired Suh-Mim, the beautiful Deer. In frustration, he killed Welgatim. The next morning his wife reappeared, singing and cooking by the fire. This cycle continued each day until one morning Welgatim warned Weh-Pom not to strike again. He failed to listen and awoke to an empty home. Without breakfast, Weh-Pom stepped out to hunt but it was raining. He waited for the storm to end but it continued until a great flood arose, leaving Weh-Pom hungry and all alone. Welgatim’s flood caused the land to grow cold and dark. The animals met to choose the best candidate to retrieve fire from Mount Te-e-m-a. Grizzly Bear or Hu-neh-he-sim, the first choice, failed because for all his power, he lacked endurance. We are fortunate in the Crocker’s continued growth. The museum was able to procure Georgia O’Keeffe’s It Was a Man and a Pot. This painting represents humanity’s tie to the Earth and the Earth’s tie to humanity. The piece is reminiscent of a kapala, a symbol of offering and sacrifice. 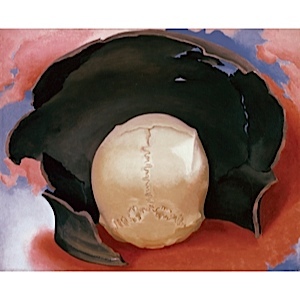 Georgia O’Keeffe, It Was a Man and a Pot, 1942. Oil on canvas. 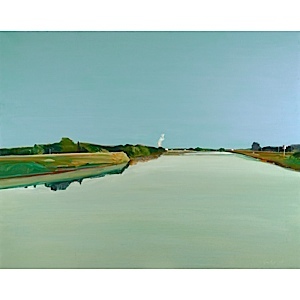 Gregory Kondos, Sacramento River, 1981. Oil on canvas. Currently, the museum has a special exhibit, A Touch of Blue: Landscapes by Gregory Kondos. Mr. Kondos has painted much of the Sacramento Valley region and the Sierra Nevada. My son and I were blown away by the magnificent blues of his works. We realized we needed to step back and gain a new perspective on familiar landscapes. From across the gallery, we were drawn by Sequoias, Half Dome, the Sacramento River, Napa Valley vineyards and his Greek and French landscapes. Never before had we experienced art lighting up a room. Again, the viewer observes the sense of solitude and a link with the natural surroundings (although in some cases, human altered as they may be.) The blues are calming and soothing while capturing that bright element of a day among the mountains and valleys of Northern California on a spring day with a cool delta breeze and the hot sun.